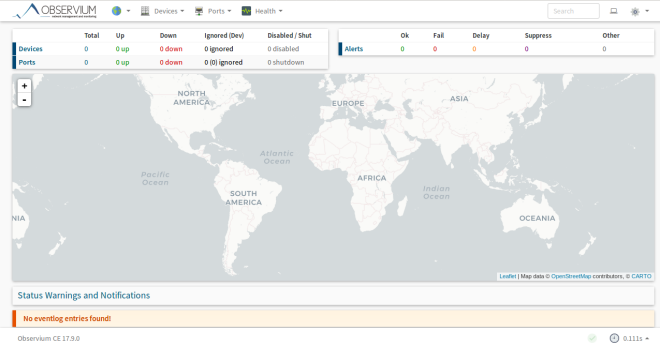 Observium is an open source and light weight network monitoring tool. It allows you to monitor all of the network devices and operating systems in your datacenter. Observium provides a powerful yet simple and easy to use web interface to monitor the health and status of your network devices. In this guide, we will show you how to install and configure Observium on an Debian 9 server. One Debian 9 server installed either on bare-metal hardware or on a virtual machine with root access. Once all the prerequisites are installed, you can proceed to the next step. Observium requires Apache, Php and MySQL to function. So you will need to install LAMP server on your system. Once the MariaDB is secured, you will need to create a database and user for Observium. Before accessing Observium, you will need to allow port 80 through the UFW firewall. By default, UFW is not installed on Debian 9, so you will need to install it first. Now you can proceed adding your network devices and servers to get the status and health report.